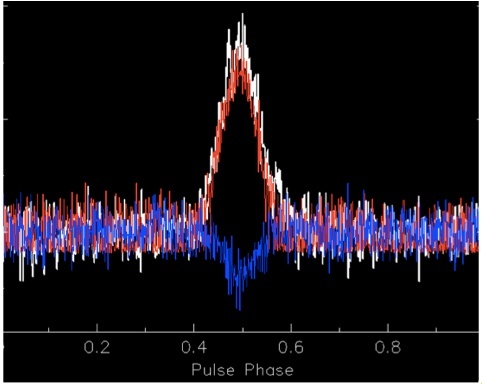 1.4 GHz radio signal of the pulsed emission of pulsar PSR J1357−6429, measured with the Parkes radio telescope ( S. Johnston et al.). Pulsar wind nebulae - multi-lightyear-sized bubbles of high-energy electrons and positrons power by a pulsar - are probably the most abundant class of galactic sources of very high energy gamma rays. Measurements of pulsar wind nebulae by H.E.S.S. 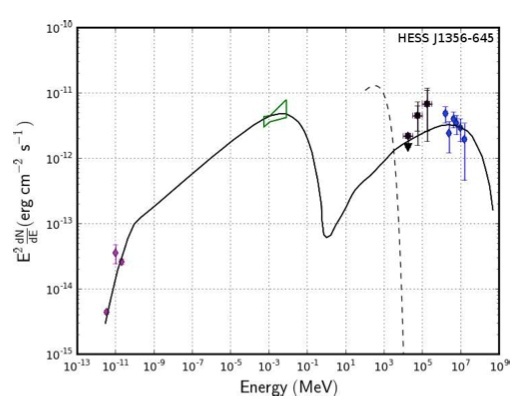 at very high (TeV) energies were recently complemented at GeV energies in a comprehensive study using Fermi data (F. Acero et al., 2013). One of the pulsar wind nebula candidates explored there is HESS J1356−645, a gamma ray source discovered close to the pulsar PSR J1357−6429. PSR J1357−6429 is a relatively young pulsar, with a characteristic age of about 7000 years, a rotation period of 166 ms, and a very large spin-down energy loss of a few 10^36 ergs/s, ample to power significant gamma-ray emission by the radiating electrons, given the distance of about 7000 light years. 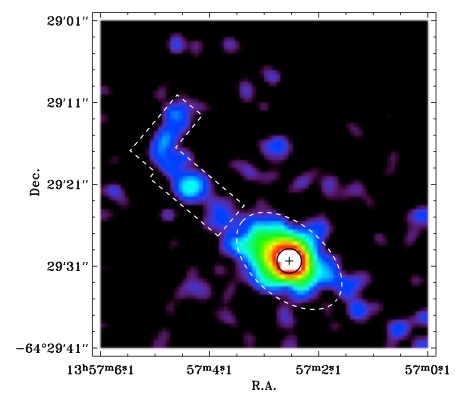 PSR J1357−6429 was discovered in the Parkes multibeam survey of the Galactic Plane (Camilo et al. 2004). H.E.S.S. observations of the region of PSR J1357−6429 were first taken as part of the Galactic Plane Survey, followed up by dedicated observations, for an effective exposure of about 10 h. HESS J1356−645 is visible as a highly significant, extended (0.2 degr. size) source of very high energy gamma rays with a flux of about 10% of that of the Crab nebula (Fig. 1, Abramowski et al. 2011). The peak of the gamma ray emission is displaced about 7' from the pulsar, not very dissimilar from the displacements observed for other pulsar wind nebulae, and attributed to ambient pressures shifting the electron bubble, or to pulsar proper motion, leaving behind the electrons created shortly after pulsar birth, when the energy loss was highest. Radio images show emission from the same region as the gamma ray source, but lack strong emission from the pulsar position, as might have been expected for a pulsar powering an extended nebula. X-ray observations with XMM-Newton (Abramowski et al. 2011) and Chandra (Lemoine-Goumard et al., 2011, Fig. 2), on the other hand, show both emission from the location of the pulsar, as well as larger-scale diffuse emission. A pulsar wind nebula powered by PSR J1357−6429 seems the most plausible explanation. The wide-band spectral energy distribution including recent Fermi data (Fig. 3, F. Acero et al., 2013) confirms this, with the typical two-component emission spectrum peaking in the X-ray keV range, and in the TeV range. Fig. 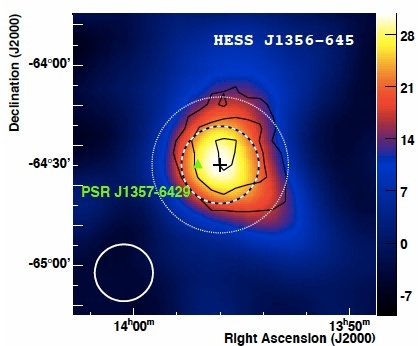 1: Image of the very high energy gamma ray source HESS J1356-645. The black contours indicate the 5, 7 and 9 sigma significance levels; the full white circle illustrates the point spread function of the instrument, after smoothing of the image. The position of PSR J1357−6429 is marked with a green triangle. Fig. 2: Chandra X-ray image of PSR J1357-6429 (Lemoine-Goumard et al., 2011), showing saturated emission around the pulsar (cross) surrounded by extended emission (elliptical contour with 7" and 4" semi-axis) and a jet-like feature. Fig. 3: Spectral energy distribution of the emission from the HESS J1356-645 region, from radio to very high energy gamma rays (F. Acero et al., 2013).